Clear Lake, SD is our Chevy Destination this week and we’re hunting Pheasant. Do you love pheasant hunting or have you ever wanted to try? Be sure to check out the show this week and we’ll have you itching to book a trip to South Dakota! This entry was posted in Episode, Featured Stories, Fox Sports Net - This Week and tagged bob redfern, hunting, pheasant hunting, South Dakota, Upland Bird Hunting on 04/09/2018 by BROM. Tune in and join us this week at White Lake Hunting Lodge in White Lake, South Dakota, as Bob goes on the ultimate Pheasant hunt! Fall pheasant hunting in White Lake, South Dakota is a destination that every bird hunter searches for and Bob has found one of the best! This entry was posted in Episode, Featured Stories, Fox Sports Net - This Week and tagged pheasant hunting on 01/23/2016 by BROM. This week Bob is weathering the elements in South Dakota doing what he enjoys in the fall. Upland Bird South Dakota is the experience of a lifetime, and really like to upland bird hunt this is the place for you. Wide open spaces and pheasant hunting is what it’s all about. Once you arrive at the lodge in beautiful South Dakota you’ll never want to go home! Bob is joined by the owner Larry Smith who has owned White Lake Hunting Lodge for over 20 years. Stay tuned for some great pheasant hunting action because this is a show you won’t want to miss! This entry was posted in Episode, Featured Stories, Fox Sports Net - This Week and tagged Larry Smith, pheasant hunting on 09/28/2014 by BROM. Bob is in Iowa this week for an awesome pheasant hunt. He’ll be hunting alongside Frank Brownell and his son Pete, the largest suppliers of firearm accessories, gun parts and Gunsmithing tools in the world! We’ve got an inside look at the history and future of Brownells. This is an episode you won’t want to miss! 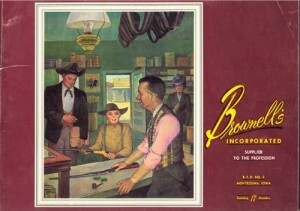 For over 70 years, Brownells has been providing quality Gunsmithing tools, gun parts and service to the firearms industry. For all but two of those years, there has been a consistent brand image, the oblong horizontal shape of our catalog and the graphical design of our Brownells logo. For all of those years, these two uniquely, identifiable products have stood for our promise of service, selection and satisfaction. This entry was posted in Episode and tagged bob redfern hunting, Brownell's, iowa pheasant, pheasant hunting on 02/12/2010 by BROM. On this weeks show Bob heads to Lynnville, Iowa for some pheasant hunting. Thinking about doing a little pheasant hunting this year? We’ve got just the place! This entry was posted in Episode and tagged bob redfern, lynnville iowa, pheasant hunting on 01/29/2010 by BROM.